When Frederick Law Olmsted designed Biltmore’s gardens, he planned their beauty to last through all four seasons, so it’s little wonder the blooms of estate gardens continue well into fall. In the formal gardens, the show continues with carefully planted flowers designed to blossom through cooler temperatures. The Walled Garden hosts an array of fall mums that provide color from late September through the end of October. This year’s color show includes brilliant blooms in red, purple, orange, and yellow. Rose lovers can enjoy a sneak peek of the judging of the annual International Rose Trials September 22–23. 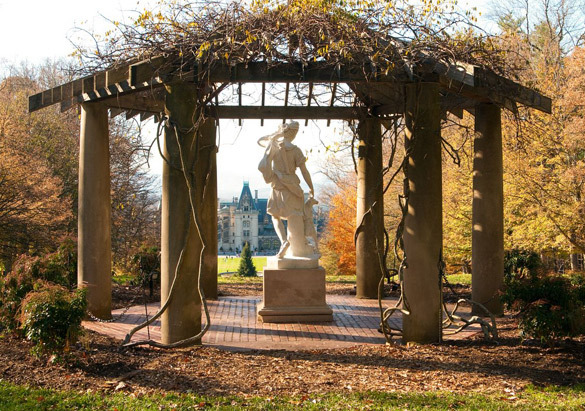 Since 2011, Biltmore’s historic Rose Garden has served as the home for the trials. More than 90 varieties from growers and breeders worldwide have been planted and cared for by Biltmore’s horticulturalists. The glory of fall blooms continues through the estate’s informal gardens. The Azalea Garden, filled with 15 acres of native azaleas, enjoys a second bloom in the fall. Other gardens are also alive with late blooming annuals, perennials, and vibrant leaves on the estate’s native and exotic trees. For those looking for fall color beyond the gardens, a scenic drive through the estate provides a wonderful opportunity to slow down and savor views of forests flush with color and panoramic vistas. The road by the Reception & Ticketing Sales Center is populated by vibrant orange and red sugar maple trees, while an afternoon drive by the Bass Pond offers views of bright fall foliage reflecting in the water. A trip to Antler Hill Village & Winery provides the chance to drive by the Lagoon and enjoy views of the house’s western façade framed by vibrant leaves. Between the estate’s gardens and grounds, the promise of fall color begins in early September and continues until late October, making any time a perfect time to experience autumn on the estate. Plan your visit today.